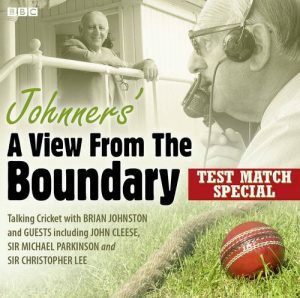 During the lunch interval on the Saturday of every Test in England, BBC Radio’s Test Match Special used to invite a well-known guest into the commentary box for a chat with Brian Johnston about themselves and their passion for cricket. Some turned out to be able cricketers, but they all had stories to tell about matches they had seen and cricketers they had met. Barry Johnston has selected five chats from the series ‘A View from the Boundary’, beginning in 1980 with the playwright Ben Travers, and his vivid recollections of W.G. Grace and other characters from the golden age of cricket. He is followed by Michael Charlton, the political broadcaster and former cricket commentator, who covered the great Australia v West Indies tied Test in 1960, and John Cleese, a lifelong Somerset supporter, who tells some funny stories about Monty Python and Fawlty Towers. Hollywood film star Sir Christopher Lee recalls watching the legendary Jack Hobbs and Don Bradman, and Sir Michael Parkinson talks about opening the batting at Barnsley with Dickie Bird and how he nearly played for Hampshire.